Emerging market and developing economies have achieved a remarkable decline in inflation since the early 1970s, supported by robust monetary policy frameworks, strengthening of global trade, financial integration, and the disruptions caused by the global crisis. The column argues that a continuation of low and stable inflation in these countries is not guaranteed. If this wave of structural and policy-related factors loses momentum, elevated inflation could re-emerge. Policymakers may find that maintaining low inflation is as difficult as achieving it. 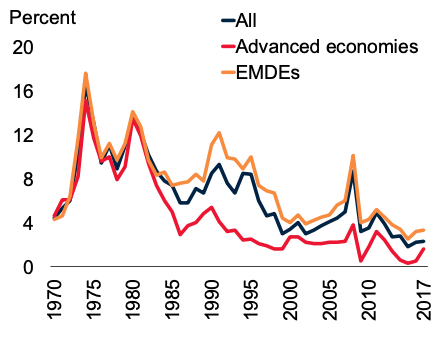 There has been a remarkable decline in inflation since the mid-1970s in emerging market and developing economies (EMDEs) (Daly and O’Doherty 2018, Ha et al. 2019). Median annual national consumer price inflation has fallen from persistent double digits in the 1970s to about 3% in 2018 (Figure 1). Figure 1 Global inflation since the 1970s. A. Median CPI inflation, by country group. Note: Median year-on-year consumer price inflation for 29 advanced economies and 123 EMDEs (including 28 low income countries). Note: All inflation rates refer to year-on-year inflation. Share of 11 advanced economies and 24 EMDEs with consumer price inflation below-target or within target range. Horizontal line indicates 50%. Source: Bloomberg, Consensus Economics, Haver Analytics, IMF International Financial Statistics and World Economic Outlook databases, OECDstat, World Bank. 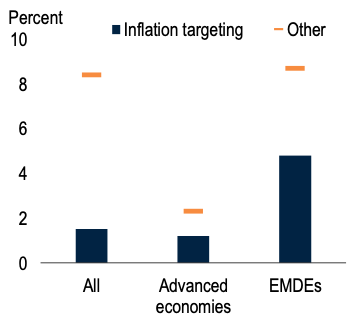 By 2017, inflation was within or below central bank target ranges in three-quarters of the EMDEs that had adopted inflation targeting. Inflation has also fallen around the world, from a peak of nearly 17% in 1974 to less than 2.5% in 2018. The decline in inflation began in the mid-1980s in advanced economies and in the mid-1990s in EMDEs. By 2000, global inflation had stabilised at historically low levels. Low and stable inflation has historically been associated with greater output stability, higher growth, and better development outcomes. EMDEs will continue to get the benefits of low inflation only if the structural and policy-related factors that have fostered global disinflation are sustained. What have been the main drivers of disinflation in EMDEs? The global crisis played a role in pushing inflation down around the world, but the longer-term trend of disinflation has been driven by many structural forces. The most significant have been the widespread adoption of effective and transparent monetary, exchange rate, and fiscal policy frameworks, as well as globalisation (Figure 2). Note: Columns indicate median inflation in countries with high trade-to-GDP ratios ('Trade') or financial assets and liabilities relative to GDP ('Finance') in the top quartile ('High openness') of 175 economies during 1970-2017. 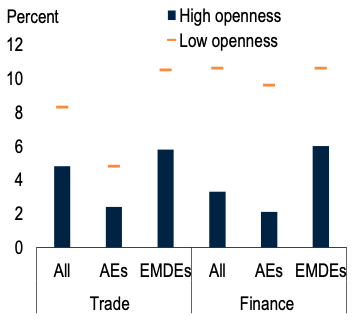 Horizontal bars indicate countries in the bottom quartile ('Low openness'). Differences are statistically significant at the 5% level. Notes: Columns indicate median inflation in country-year pairs with a central bank independence and transparency index in the top quartile of the sample (B) or with inflation targeting monetary policy regimes (C). Horizontal bars denote medians in the bottom quartile (B) or with monetary policy regimes that are not inflation targeting (C). Differences are statistically significant at the 5% level. Source: Ha et al. (2019), Haver Analytics, IMF International Financial Statistics and World Economic Outlook databases, OECDstat, World Bank. Macroeconomic policies. In the second half of the 1980s and during the 1990s, many EMDEs implemented macroeconomic stabilisation programmes and structural reforms, and gave their central banks clear mandates to control inflation. These resilient policy frameworks facilitated more effective control of inflation (Taylor 2014, Fischer 2015). Inflation tends to be lower in countries that employ an inflation-targeting framework and that have more independent and transparent central banks. Changes in fiscal policy frameworks have also contributed. Fiscal rules have been adopted in 88 countries, including 49 EMDEs. Other reforms, including labour market and product market liberalisation and the removal or easing of foreign exchange market controls, also assisted the disinflation process. Trade and financial integration. Trade integration has contributed to lower prices. Higher shares of imports in consumption and production increase competitive pressures from foreign producers (Andrews et al. 2018). Global value chains are a transmission channel for global disinflationary cost shocks (Auer et al. 2017). Financial integration has helped discipline macroeconomic policies, because more financially-integrated economies are likely to implement monetary policies targeting low and stable inflation (Kose et al. 2010). Inflation tends to be lower in economies that are more open to trade and financial flows. Can EMDEs sustain low inflation? Low inflation cannot be taken for granted (Rogoff 2003, 2014, Draghi 2016, Carstens 2018). If cyclical and structural forces become less disinflationary in the next 10 years than they have been over the past 50 years, inflation could rise globally. The structural innovations and policies that have lowered inflation may lose momentum, or be rolled back in response to populist sentiment. Slowing globalisation. Rising protectionist sentiment may slow or even reverse the pace of globalisation. New tariffs and import restrictions have been put in place in advanced economies and EMDEs since 2017, and there is a high probability of more trade restrictions in major economies. Weakening monetary policy frameworks. A shift from a strong mandate of price stability to objectives related to the financing of government would undermine the credibility of monetary policy frameworks and raise inflation expectations. When central bank independence and transparency declines in EMDEs, inflation expectations become less well-anchored and there is greater pass-through of exchange rate movements to inflation. Weakening fiscal policy frameworks. Populist sentiment could inspire a move away from rule-based fiscal policies. Fiscal rules can become ineffective if commitment to them falters (Wyplosz 2012). 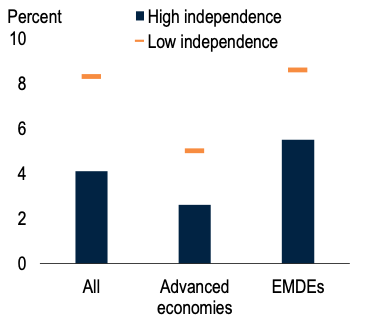 Mounting public and private debt in EMDEs could also weaken commitment to strong fiscal and monetary policy frameworks. 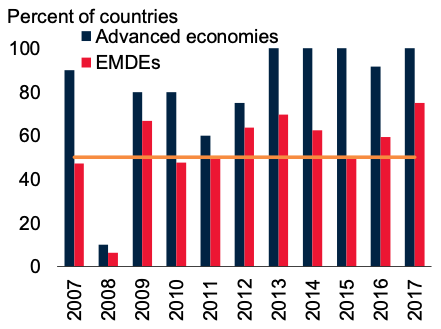 Government or private-sector debt has risen in more than half of EMDEs since 2012, including in many low-income countries (World Bank 2018). EMDE sovereign credit ratings have continued to deteriorate, with some falling below investment grade, reflecting concerns about rising debt and deteriorating growth prospects. Maintaining low inflation can be as great a challenge as achieving low inflation. During the Bretton Woods fixed exchange rate system, which lasted from the post-war period to 1971, and during the Gold Standard of the early 1900s, inflation was also low and stable before. But these previous periods of sustained, low global inflation came to an end (Figure 3). Note: Median of annual average inflation in a sample of 24 economies for which data are available across the full period. The sharp increase in oil prices in 1973-74 led to a rapid acceleration in global inflation (Kose and Terrones 2015). Global inflationary pressures also led to a significant increase in domestic inflation in developing economies, including those that experienced relatively low and stable inflation in the late 1960s and early 1970s (Cline 1981). All three episodes of sustained low inflation have been characterised by inflation below 5% for an extended period. Inflation, however, rose sharply when the previous two episodes ended. EMDE policymakers need to recognise the increasing role of the global inflation cycle in driving domestic inflation. Options to help insulate economies from the impact of global shocks include strengthening institutions, including central bank independence, and establishing fiscal frameworks that can both assure long-run debt sustainability and provide room for effective counter-cyclical policies. Low inflation in EMDEs in the past two decades is no guarantee of low inflation in the future. Authors’ note: The findings, interpretations, and conclusions expressed in this article are entirely those of the authors. They do not necessarily represent the views of the World Bank, its Executive Directors, or the countries they represent. Andrews, D, P Gal, and W Witheridge (2018), “A Genie in a Bottle: Inflation, Globalisation, and Competition”, VoxEU.org, 11 May. Auer, R, A Levchenko, and P Sauré (2017), “International Inflation Synchronization through Global Value Chains", VoxEU.org, 19 May. Cline, W R (1981), World Inflation and the Developing Countries, Brookings Institution. Daly, K, and L O'Doherty (2018), “The Convergence in Emerging Market inflation”, VoxEU.org, 5 March. Draghi, M (2015), “Global and Domestic Inflation”, Speech at the Economic Club of New York, 4 December. Fischer, S (2015), “Global and Domestic Inflation”, Speech at Crockett Governors’ Roundtable 2015 for African Central Bankers, University of Oxford. Ha, J, M A Kose, and F Ohnsorge (2019), Inflation in Emerging and Developing Economies: Evolution, Drivers and Policies, World Bank. Kose, M A, E Prasad, K Rogoff, and S-J Wei (2010), “Financial Globalization and Economic Policies”, in Handbook of Development Economics 5, edited by D Rodrik and M Rosenzweig, North-Holland. Kose, M A, and M E Terrones (2015), Collapse and Revival. Understanding Global Recessions and Recoveries, International Monetary Fund. Rogoff, K (2003), “Globalization and Global Disinflation”, Federal Reserve Bank of Kansas City Economic Review 88(4): 45-78. Rogoff, K (2014), “The Exaggerated Death of Inflation”, Project Syndicate, 2 September. Taylor, J B (2014), “Inflation Targeting in Emerging Markets: The Global Experience”, Speech at the conference on Fourteen Years of Inflation Targeting in South Africa and the Challenge of a Changing Mandate, South African Reserve Bank, Pretoria. World Bank (2018), Global Economic Prospects: The Turning of the Tide?, World Bank. Wyplosz, C (2012), “Fiscal Rules: Theoretical Issues and Historical Experiences”, In Fiscal Policy after the Financial Crisis, edited by A Alesina and F Giavazzi, University of Chicago Press.